The following is Part 2 of the article by the same title, in which we summarize conclusions and possible ways to act on them. It’s a partial summary of conclusions from our weekly fxempire.com analysts’ meeting, in which we share thoughts and conclusions about the weekly outlook for global equities, currencies, and commodity markets. Given the quiet holiday week, we stepped back to look at some bigger picture developments. Just for continuity, here from Part 1 is the chart and its key implications. EU banks could end up killing the EU slowly by stifling liquidity, or quickly by collapsing from overexposure to troubled sovereign. The chart below summarizes how excessive purchases of EU sovereign bonds by domestic and other EU banks is limiting growth, raising deflation risks, and with the failed SRM deal, raising the risk of another EU banking crisis. · Hampering EU Growth And Raising Deflation Risk: Too much sovereign bond issuance and purchase by their domestic banks and other EU banks has crowded out private sector borrowers (the ones who ultimately create the jobs, spending, taxes, growth, etc.). This lack of private sector lending exacerbates the EU’s slowing growth (ex-Germany) and the threat of deflation that further hurts growth. 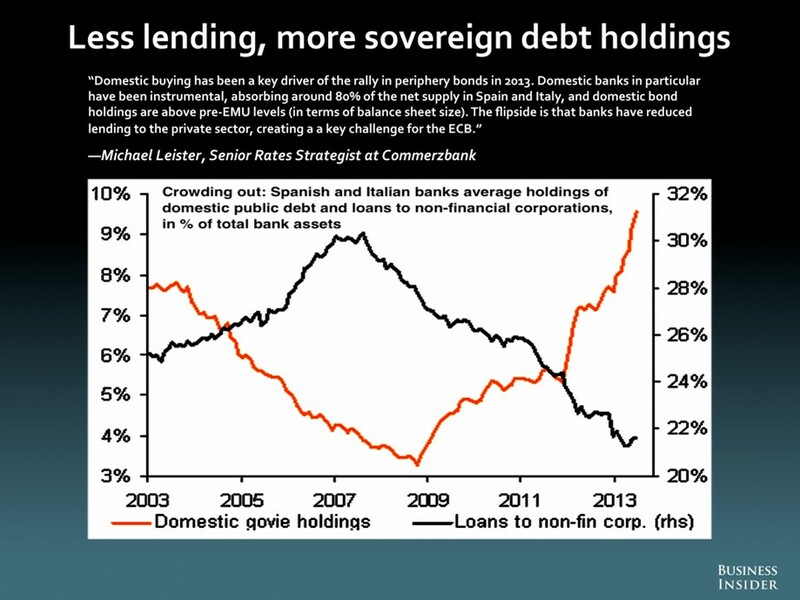 The second chart below merely confirms the decline in commercial lending. · Raising Risk Of Another Banking Crisis: The accelerating rise in the amounts of GIIPS and other EU sovereign bonds as a proportion of total EU bank assets raises contagion risks from any single bank or sovereign insolvency, tightening the inter-dependence (or link, aka “doom loop”) between EU governments and their banks that has been at the heart of most EU crisis and bailouts (of both banks and GIIPS governments). See Part 1 for the complete explanation of the background and risks implied by the above chart, as well as for links to our article on some likely outcomes for the EUR and ECB. Here we summarize Part 1, and then discuss their implications. First, contrary to consensus opinion, the risk of a new bout of EU crisis is rising, not falling. If we then consider the following, it’s much higher. Europe’s liquidity problems are getting worse, to the point that the ECB has had repeatedly been unable to sterilize portions of its secondary market bond purchases (SMP) because banks prefer holding cash over ECB bonds) so that the EUR money supply is quietly expanding. Meanwhile that lack of ready credit is hampering the private sectors’ weak recovery. The coming ECB bank stress tests further reduce liquidity and increase deflation, as banks hoard cash and top tier capital in preparation for those tests. When the next bank failure occurs there is no functioning SRM program, only the OMT that no one wants to use. That means we must now once again doubt the credibility of the coming ECB bank stress tests. The ECB will not knowingly risk starting a crisis by failing banks for which there is no backup plan. The EU prints money, possible with German assent, as the only short term solution available to save or wind down s bank without causing a contagion fear driven market panic, given the lack of a funded, quickly deployable SRM mechanism to backstop the system. Second, it’s clear from the above that the EU needs to get increase liquidity and availability of affordable credit to the private sector. One way or the other, that means the supply of Euros should explode in 2014 and send the EUR down hard, along with any assets tied to it. See our post here for likely ways that will happen in 2014. Given the above, that’s not the worst risk facing the EU. Is it any wonder that the IMF has recently warned that “1930s-style debt defaults are likely”? The technical picture for the EURUSD, per its weekly chart below, remains overall bullish, though it we see clear signs of weakening. · The EURUSD uptrend that began in July 2012 remains intact per the weekly EURUSD chart above. 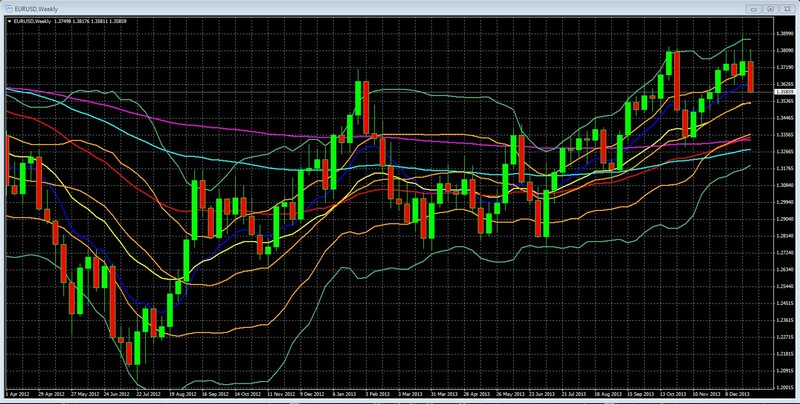 · The upward slope is strong, with its 10 week exponential moving average (EMA) in dark blue holding as support. · All EMAs continue to move higher, with the shorter period EMAs layered above the longer period EMAs, a sign of continued upward momentum. See my book, Chapter 8, for full details on using moving averages. EURUSD once again closes the week below its upper Double Bollinger Band Buy Zone (aka DBBBZ, the upper quartile bounded by upper green, orange Bollinger bands). That means as of now there isn’t enough upward momentum to justify new EURUSD longs. The EURUSD has spent more time out of the DBBZ than in it since late October, suggesting that upward momentum has stalled. See the 4 RULES FOR USING THE MOST USEFUL TECHNICAL INDICATOR, DOUBLE BOLLINGER BANDS, for a clear, concise explanation of why DBBs are so useful and how to interpret them. Given the distance to the strong support area carved out last year around 1.33 and then 1.2810, there’s a lot of room to profit from just a normal retest of these areas if we can get some confirmation of the trend heading lower. Given the above, the long term fundamental picture for the EUR is not positive. · Everyone except short term traders should avoid assets that would be affected by an EU banking crisis that is more likely now than ever. I personally would also avoid short positions at this time, given that timing the next crisis and EUR plunge is impossible until the charts show us it’s already starting. Outcomes will depend on a very unpredictable political process in Europe. Recent history shows that when faced with contagion risk they opt for deferring the problem with more borrowing with printed money to those unlikely to pay. Maybe that will continue as long as the bills are relatively small compared to what Germany believes it earns from a strong EU, EUR, and low inflation. However the recent SRM deal allows Germany the option of walking away if the bill for a big bailout is too high for its liking. See here for details. · For All Long Term Investors Or Traders: If you have long positions in assets with significant EU or EUR exposure, consider reducing or hedging those positions. · The above is critical for anyone with long positions in the stocks and bonds of GIIPS banks (or anything heavily exposed to them) and keep deposits held in them well below insured limit of about 100k EUR. · EUR Based Investors: As much as is practical, keep liquid assets outside of EU domiciled institutions and have as much of your portfolio diversified into assets connected to other currencies, particularly those not closely connected to the EU (AUD, NZD, CAD) or in currencies that tend to move opposite the EUR, like the USD. See here for why the USD tends to move in the opposite direction of the EUR. Short term traders – no changes: Again, in the near term no one knows what will happen, and of course short EURUSD is already a somewhat crowded trade per both COT reports. Per my real time small sample of small retail traders, there is no change, as long positions remain well within their 30%- 50% range of recent months. 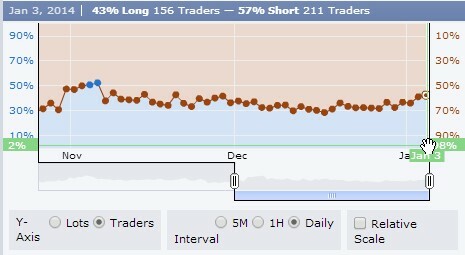 Long term traders: We wait until the EURUSD trend begins reversing before shorting the EURUSD. The challenges implied above suggest that anyone whose wealth is based mostly in Euros needs to know about ways to hedge the risk of EUR debasement. As we’ve written before, those based in the USD, JPY, and probably the AUD and GBP should be doing the same. See here for an award winning guide on many ways to do that, even if you never trade currencies.